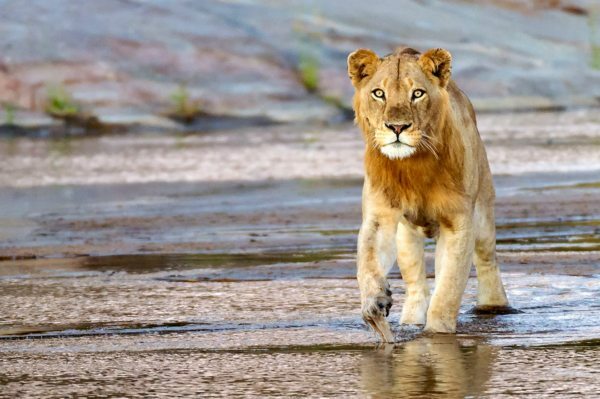 This honeymoon safari offers a romantic journey from the rugged, savannahs and woodlands of the Greater Kruger to the idyllic beaches and untouched corals of Benguerra Island. 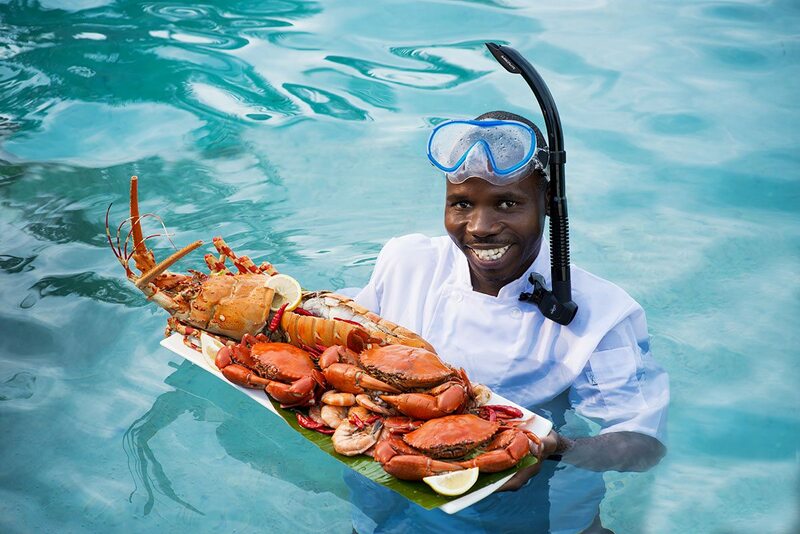 Every moment in South Africa and Mozambique felt like an ode to love, whether snuggling up on game drives or enjoying exclusive castaway picnics on a sliver of sand. 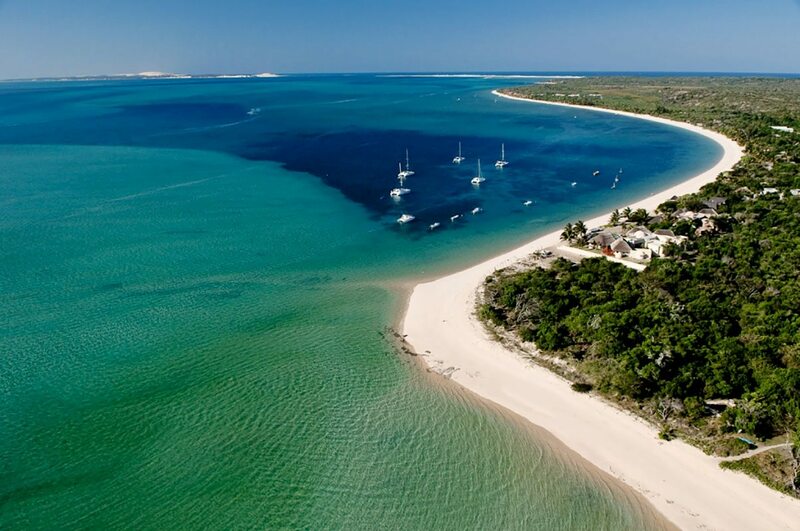 A perfect mix of safari and beach destinations from the game-rich savannahs and woodlands of the Greater Kruger to the turquoise waters of the Indian Ocean and the many isles, sandbanks and channels of the Bazaruto Archipelago. 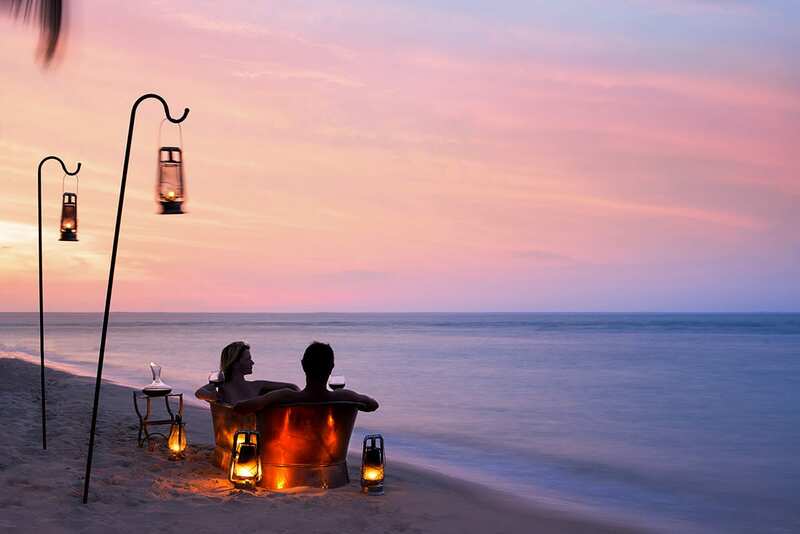 Romance at every opportunity whether enjoying private dinners, bush sundowners, tracking animals on foot and big cat encounters or beach meals, sandbar picnics and snorkelling Mozambique’s coral reefs. Both lodges offering luxurious cottages overlooking water: Kirkman’s Kamp next the Sand River with a busy waterhole and a rim-flow swimming pool, and Benguerra Island Lodge with private plunge pool alongside the palm-fringed sandy beach. For more information see Kirkman’s Kamp and Benguerra Island Lodge. After a quick transfer from the airport to Kirkman’s Kamp, we arrived in time for high tea, served on the lodge’s beautifully manicured lawns. The attentive staff made us feel special with a bouquet of flowers – later, we found rose petals strewn over our bed. After dipping our feet into the rim-flow swimming pool, we walked barefoot back to our delightfully romantic suite, which had a claw-foot bath with a view over the Sand River and a large fireplace which we lit immediately, setting the scene for our first wonderful night in Sabi Sands Game Reserve.After a late lie-in, we enjoyed a delicious and unhurried breakfast, and spent the rest of the morning lounging by the pool with our books and the company of a few curious warthog. We’d set aside the afternoon for a game drive through Sabi Sands, a savannah-woodland landscape that stretches into Kruger National Park. With no fences, limited vehicles and sensitive off-road driving, we’d been promised exceptional sightings, and our skilfull guides certainly delivered by getting us close to several cats: lion, leopard and civet! A lantern-lit dinner in the boma rounded off what had been a very special day.With the help of our guide and tracker, we were able see tracks on the side of the road, following them on foot to find their source. Keeping downwind so as not to alert any animals to our presence, we followed our tracker in single file until we found the warthog burrow. We waited silently behind a termite mound, until the wily creature emerged in a great cloud of dust – apparently this helps keep predators at bay. An afternoon game drive and sundowners in the bush was the perfect blend of romance and adventure for our last day in the wild.We awoke the next morning to the roar of a lion, and cuddled deeply into each other listening to the sounds of the wakening wild. After a quick cup of coffee and a last delicious breakfast, we were ready for the next phase of our safari adventure. After a quick transfer from the airport to Kirkman’s Kamp, we arrived in time for high tea, served on the lodge’s beautifully manicured lawns. The attentive staff made us feel special with a bouquet of flowers – later, we found rose petals strewn over our bed. After dipping our feet into the rim-flow swimming pool, we walked barefoot back to our delightfully romantic suite, which had a claw-foot bath with a view over the Sand River and a large fireplace which we lit immediately, setting the scene for our first wonderful night in Sabi Sands Game Reserve. After a late lie-in, we enjoyed a delicious and unhurried breakfast, and spent the rest of the morning lounging by the pool with our books and the company of a few curious warthog. We’d set aside the afternoon for a game drive through Sabi Sands, a savannah-woodland landscape that stretches into Kruger National Park. With no fences, limited vehicles and sensitive off-road driving, we’d been promised exceptional sightings, and our skilfull guides certainly delivered by getting us close to several cats: lion, leopard and civet! A lantern-lit dinner in the boma rounded off what had been a very special day. With the help of our guide and tracker, we were able see tracks on the side of the road, following them on foot to find their source. Keeping downwind so as not to alert any animals to our presence, we followed our tracker in single file until we found the warthog burrow. We waited silently behind a termite mound, until the wily creature emerged in a great cloud of dust – apparently this helps keep predators at bay. An afternoon game drive and sundowners in the bush was the perfect blend of romance and adventure for our last day in the wild. We awoke the next morning to the roar of a lion, and cuddled deeply into each other listening to the sounds of the wakening wild. After a quick cup of coffee and a last delicious breakfast, we were ready for the next phase of our safari adventure. The highlight of our transfer to Benguerra Island Lodge was undoubtedly the scenic helicopter flight over Mozambique’s Bazaruto Archipelago, landing on the helicopter pad of its second biggest island with wisps of sand dancing up to meet us.Thrilled to discover that the beach was mere steps from our suite, we didn’t waste a moment running down to where the waves caressed the shore. The tide was high, with the almost translucent waters of the marine national park calling to us. We cast off our clothes and ran hand-in-hand into the warm water, laughing as tiny fish went shooting off into the opposite direction. Later, we sipped at cocktails from our suspended daybed, where the only decision to make was whether to soak in our ocean-facing tub or our private infinity pool. We did both.Our romantic castaway fantasy was brought to life when we were dropped off on a sandbar late the next morning. 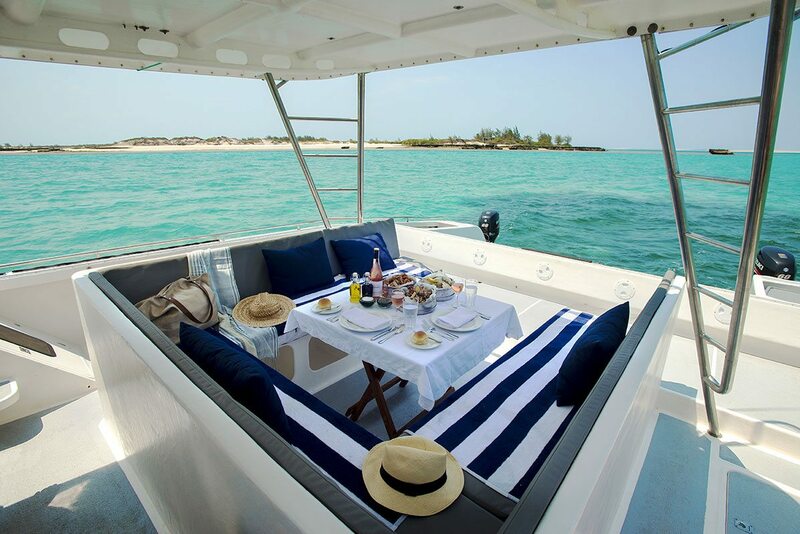 Equipped with our rather luxurious ‘survival kit’ – a Bedouin-style tent, blankets, towels, pillows and a sumptuous picnic spread – we were left to enjoy our time alone together, safe in the knowledge that the crew would collect us before our island paradise returned below the waves. After reading, snorkelling and suntanning, we walked around the island collecting pansy shells and then returned to the lodge for sundowner drinks and a private candlelit dinner on the sand, served under a canopy of stars.With some of the world’s best reefs, the archipelago did not disappoint. We discovered an underwater world that literally took our breath away, until we remembered our snorkels! We drifted along with the current, gaping at the innumerable aquatic creatures that glowed, pulsed and flashed with an otherworldly light. We chased agile turtles, glimpsed a sea snake, hovered cautiously above a beautiful lionfish and surprised a pufferfish, while my partner tried to capture the perfect shot of a manta ray. Steaming mugs of hot chocolate welcomed us back on board and we headed back to the lodge, grinning broadly.Our last day was spent on our private deck, lying on loungers and taking dips in our plunge pool, until the lure of the ocean proved irresistible and we returned to its gentle caress, floating on our backs and gazing up at the cobalt sky. Toasting each other at sunset from the deck of our dhow, we felt a tingle of anticipation for our new lives back home. A couple’s massage and dinner at the ocean’s edge, our feet lapped by the sea, was the perfect culmination of our safari – and the extended helicopter flight the next morning its crowning point. 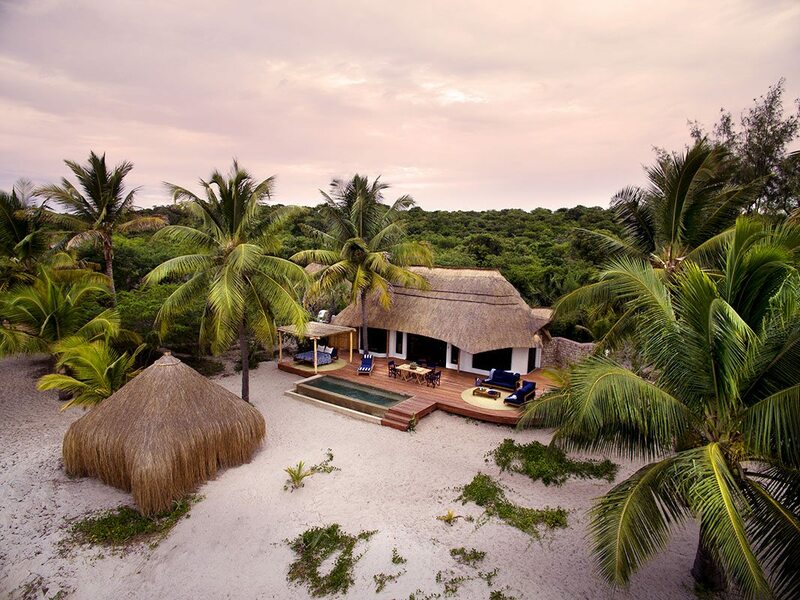 The highlight of our transfer to Benguerra Island Lodge was undoubtedly the scenic helicopter flight over Mozambique’s Bazaruto Archipelago, landing on the helicopter pad of its second biggest island with wisps of sand dancing up to meet us. Thrilled to discover that the beach was mere steps from our suite, we didn’t waste a moment running down to where the waves caressed the shore. The tide was high, with the almost translucent waters of the marine national park calling to us. We cast off our clothes and ran hand-in-hand into the warm water, laughing as tiny fish went shooting off into the opposite direction. Later, we sipped at cocktails from our suspended daybed, where the only decision to make was whether to soak in our ocean-facing tub or our private infinity pool. We did both. Our romantic castaway fantasy was brought to life when we were dropped off on a sandbar late the next morning. Equipped with our rather luxurious ‘survival kit’ – a Bedouin-style tent, blankets, towels, pillows and a sumptuous picnic spread – we were left to enjoy our time alone together, safe in the knowledge that the crew would collect us before our island paradise returned below the waves. After reading, snorkelling and suntanning, we walked around the island collecting pansy shells and then returned to the lodge for sundowner drinks and a private candlelit dinner on the sand, served under a canopy of stars. With some of the world’s best reefs, the archipelago did not disappoint. We discovered an underwater world that literally took our breath away, until we remembered our snorkels! We drifted along with the current, gaping at the innumerable aquatic creatures that glowed, pulsed and flashed with an otherworldly light. We chased agile turtles, glimpsed a sea snake, hovered cautiously above a beautiful lionfish and surprised a pufferfish, while my partner tried to capture the perfect shot of a manta ray. Steaming mugs of hot chocolate welcomed us back on board and we headed back to the lodge, grinning broadly. 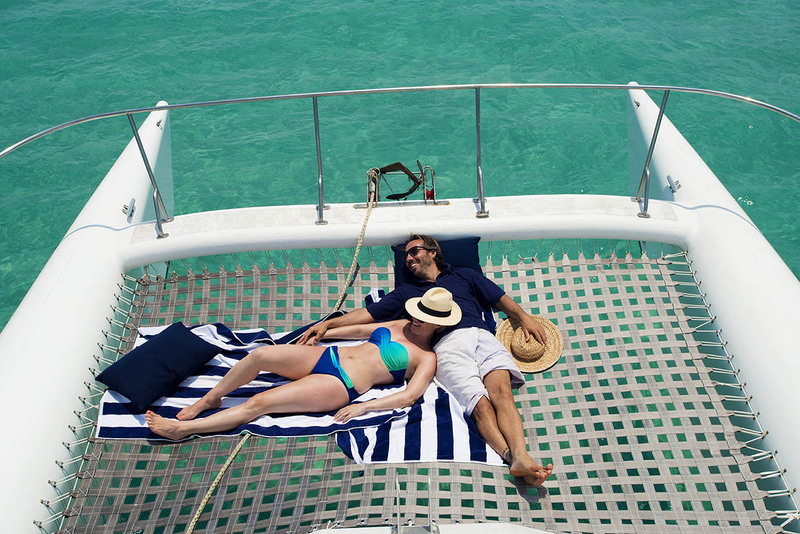 Our last day was spent on our private deck, lying on loungers and taking dips in our plunge pool, until the lure of the ocean proved irresistible and we returned to its gentle caress, floating on our backs and gazing up at the cobalt sky. Toasting each other at sunset from the deck of our dhow, we felt a tingle of anticipation for our new lives back home. A couple’s massage and dinner at the ocean’s edge, our feet lapped by the sea, was the perfect culmination of our safari – and the extended helicopter flight the next morning its crowning point. What made our luxury honeymoon safari special was the sense of romance imbued in every moment, whether sharing the joy of witnessing a magical wildlife encounter, sipping Champagne in the wild at sunset or simply cuddling next to our fire before a starlit dinner on our deck or on the beach.With water the common denominator, this safari-and-beach adventure traversed the two exceptionally beautiful countries of South Africa and Mozambique. We discovered the game-rich savannahs and woodlands of the Greater Kruger, where the seasonal Sand River – a lifeblood for the unfenced Greater Kruger National Park and its wildlife – flows through Sabi Sands Game Reserve to meet the Kruger National Park’s Sabie River, and explored the pristine coral reefs of the marine reserve surrounding Benguerra Island on the Bazaruto Archipelago.Although both delivering their own style of romance, the two lodges couldn’t have been more different in architecture and setting: Kirkman’s Kamp a 1920-style grand colonial lodge offering luxury cottages with fireplaces set amid manicured lawns overlooking the seasonal Sand River, and Benguerra Island Lodge with its thatched-roof suites strung along the beach with private plunge pools.It was wonderful to find exceptional service at both lodges though, with staff that always greeted us by name and remembered that it was our honeymoon – and providing extra touches to make us feel even more special, like bubble baths and candlelit dinners that catered to our special requirements.A range of activities highlighted some of each country’s top experiences – from game drives, walking safaris and big-cat sightings to helicopter rides, picnics on a sandbar and snorkelling. Although these were simply unforgettable, so too were those moments of just being together. What made our luxury honeymoon safari special was the sense of romance imbued in every moment, whether sharing the joy of witnessing a magical wildlife encounter, sipping Champagne in the wild at sunset or simply cuddling next to our fire before a starlit dinner on our deck or on the beach. 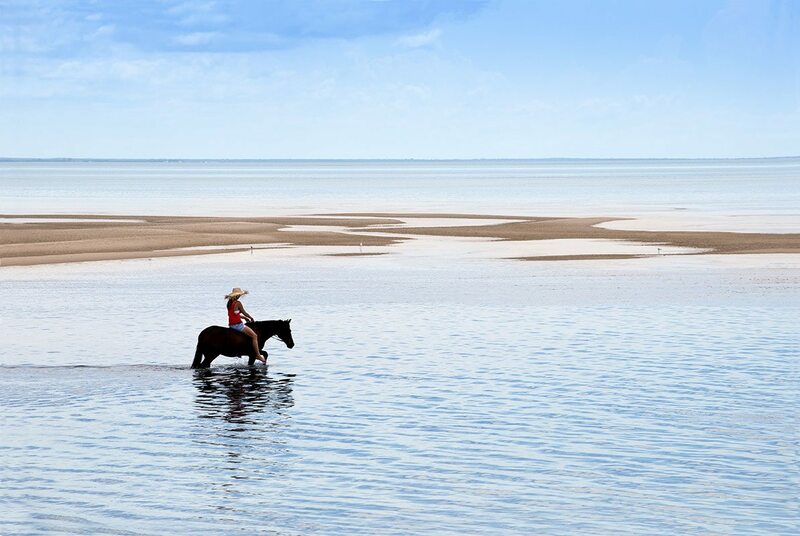 With water the common denominator, this safari-and-beach adventure traversed the two exceptionally beautiful countries of South Africa and Mozambique. We discovered the game-rich savannahs and woodlands of the Greater Kruger, where the seasonal Sand River – a lifeblood for the unfenced Greater Kruger National Park and its wildlife – flows through Sabi Sands Game Reserve to meet the Kruger National Park’s Sabie River, and explored the pristine coral reefs of the marine reserve surrounding Benguerra Island on the Bazaruto Archipelago. Although both delivering their own style of romance, the two lodges couldn’t have been more different in architecture and setting: Kirkman’s Kamp a 1920-style grand colonial lodge offering luxury cottages with fireplaces set amid manicured lawns overlooking the seasonal Sand River, and Benguerra Island Lodge with its thatched-roof suites strung along the beach with private plunge pools. 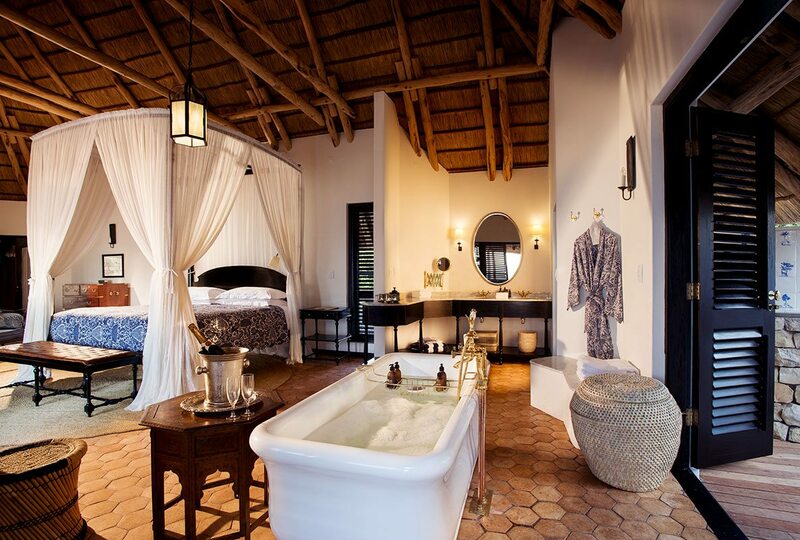 It was wonderful to find exceptional service at both lodges though, with staff that always greeted us by name and remembered that it was our honeymoon – and providing extra touches to make us feel even more special, like bubble baths and candlelit dinners that catered to our special requirements. 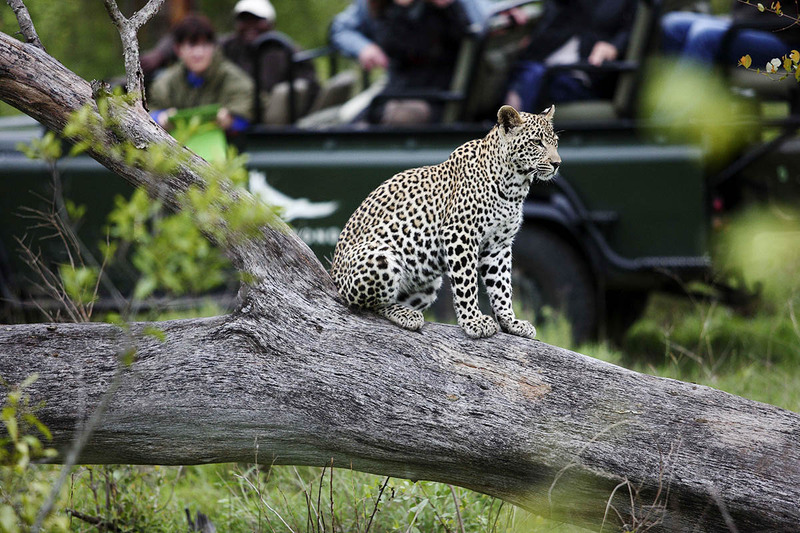 A range of activities highlighted some of each country’s top experiences – from game drives, walking safaris and big-cat sightings to helicopter rides, picnics on a sandbar and snorkelling. Although these were simply unforgettable, so too were those moments of just being together. 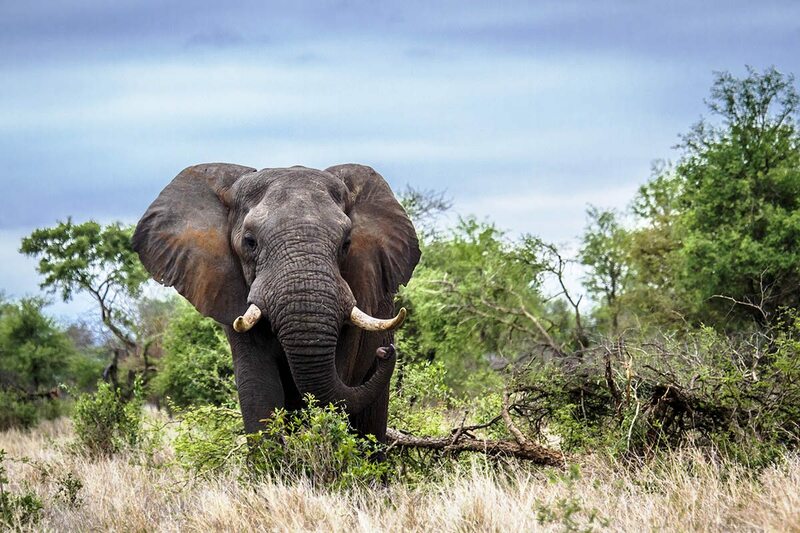 You'll find elephant near Kirkman's Kamp. 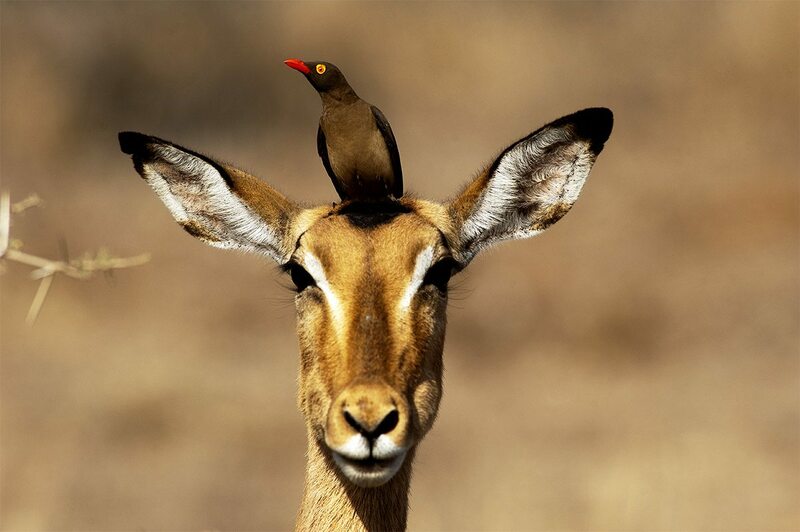 The red-billed oxpecker is often seen with impala in the Kruger area. 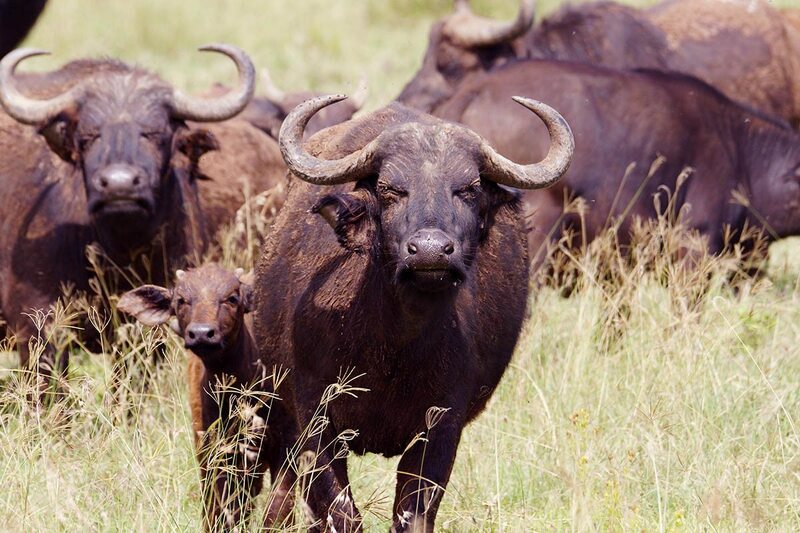 Buffalo roam the Masai Mara. 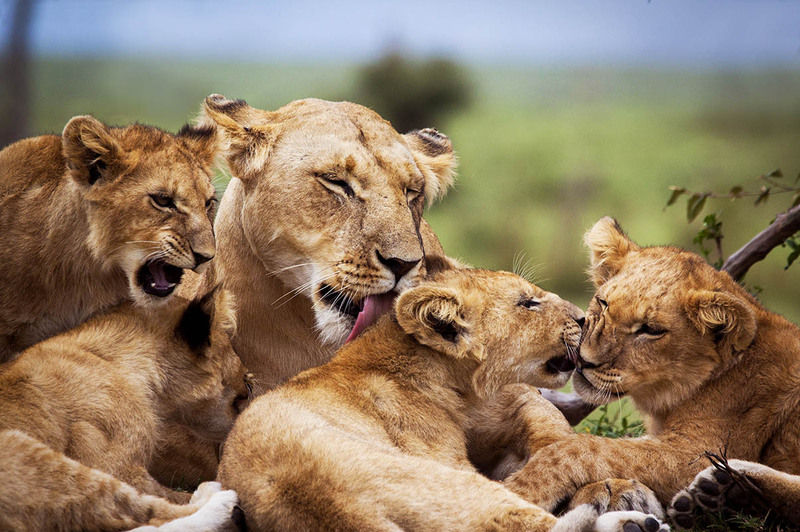 Lion prides are at home in the Masai Mara. You’ll be met as you disembark from your international flight at OR Tambo International Airport in Johannesburg, South Africa, and assisted through customs and immigration. 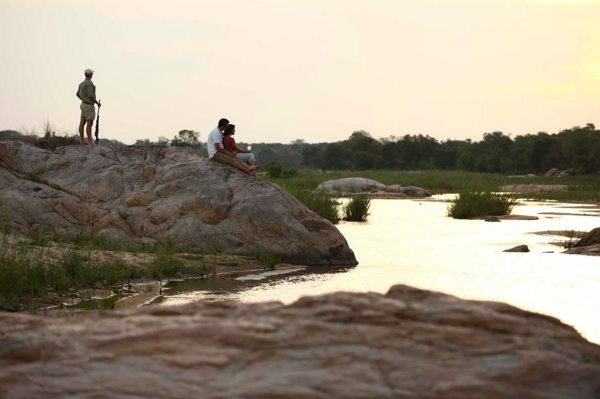 After a scheduled flight to Skukuza, you’ll take a transfer to Kirkman’s Kamp, where you’ll spend three nights. After a transfer from Kirkman’s Kamp to the airport, you’ll take a scheduled flight to Mbombela, and another to Vilankulo in Mozambique. 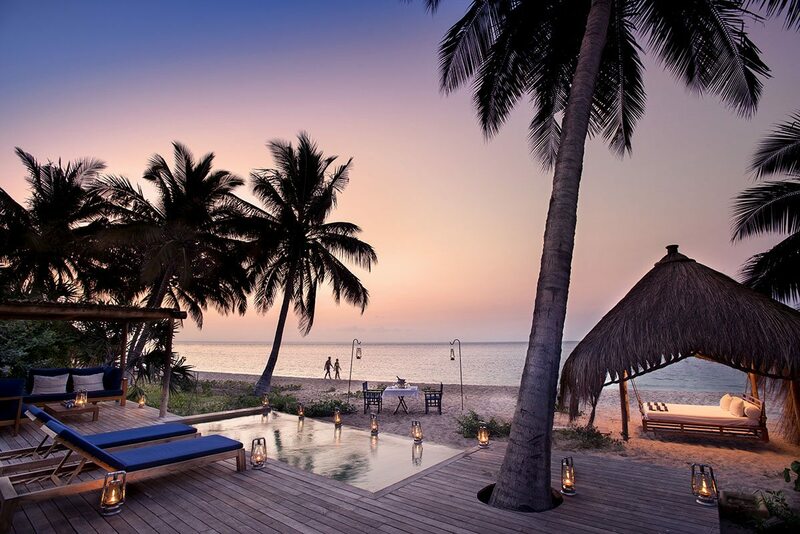 A helicopter flight will then take you to Benguerra Island Lodge, where you’ll spend four nights. 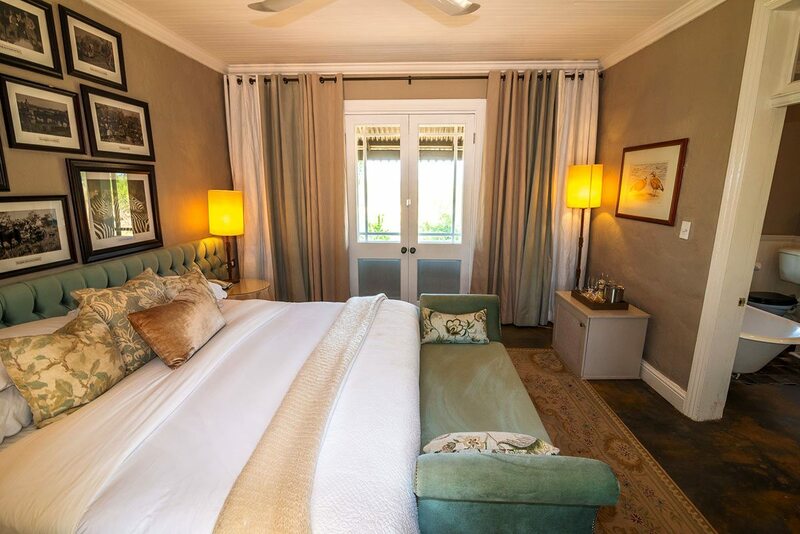 After a helicopter flight from Benguerra Island Lodge to Vilankulo, you’ll take a scheduled flight to OR Tambo International Airport in Johannesburg, South Africa, to connect with your international flight.